Bread was a dietary staple in 19th century Britain. 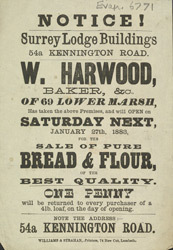 At the start of the century, many made their own bread at home, but bakers began to sell freshly made bread at low prices, and so by the century's end it was common practice to buy that instead. Bakers or their delivery boys called at large houses every day. They were smartly dressed, in straw boaters and large white aprons. Bakers had to get up very early in the morning to ensure that the bread was baked and that all the houses on their round received bread by 8am. A bakery in a town would have had special delivery carts pulled by horses, while bakeries in smaller villages sent their delivery boys out on bikes.